Learning to be givers shapes children’s values and provides the opportunity to develop kindness. Children who learn to be caring and kind feel good about themselves. 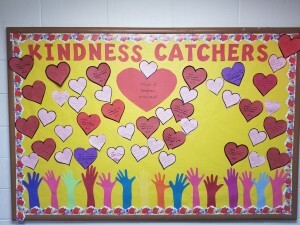 During the month of February and in conjunction with Martin Luther King Day and Valentine’s Day, the children will participate in a “Kindness Catcher Project”. The project recognizes children who do random acts of kindness. Each kind act will be recorded on a heart and displayed on BUMNS hall bulletin board. Children learn from what they see. The goal of this project is reinforce being kind. The children will learn that no act of kindness is too small. Teaching kindness begins with the youngest preschoolers. Practicing manners reminds children that a simple “thank you” can brighten someone’s day. Teaching children to recognize other people’s feelings introduces empathy. Teach children patience when they are frustrated. Patience goes hand in hand with kindness. It is never too early to practice caring and kind behavior with children. Through these small gestures we can help make the world our children will inherit a little more kind.